3-1/2x3-1/2x1-1/2" White Embossed Swirl Jewelry Box with non-tarnish cotton fiber. Made in the USA. Jewelry boxes contain 100% recycled boxboard which is the largest component of the box by weight, does not include paper outer wrap. Paper outer wrap are 20% recycled. 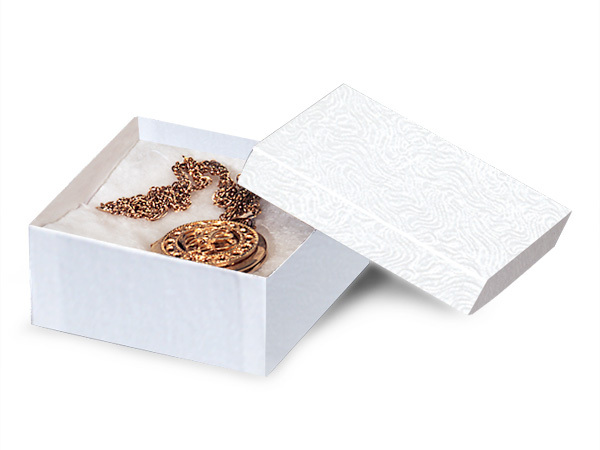 This deeper square box is perfect for necklaces, bracelets, larger pins, and small gifts. These boxes can also be used for candy packaging.